Crews will continue to relocate and upgrade existing overhead and underground telecommunication between Victoria Park Avenue and Birchmount Road until Spring 2019. Work began mid-February and will continue until the Spring 2019. Time: work will be performed between the hours of 7 am and 11 pm, seven days a week. Work zones will be erected between Victoria Park Avenue and Birchmount Road, as well as on the east side of Victoria Park Avenue, north of Eglinton Avenue East for approximately 75 metres. Nearby businesses and residents can expect noise from excavators, bobcats, trucks, and other construction equipment caused by utilities relocation activity. 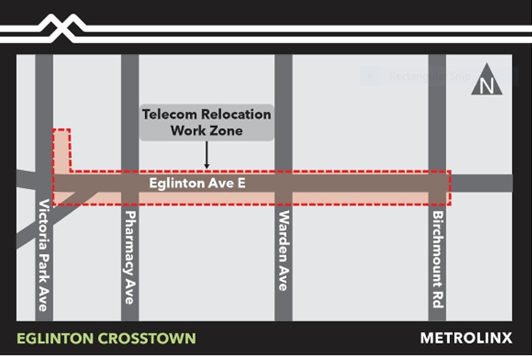 Intermittent lane reductions may be required on Eglinton Avenue East while crews set-up and/or demobilize.